3 Shades Black is thrilled to announce that we have not one, but TWO amazing shows of queer music in this years Midsumma Festival! Homophonic! is back for its 7th amazing year at La Mama Courthouse. This year we’ve kept things small, and the regular Homophonic! team are joined by a gamelan ensemble, vocal ensemble, and a talking table to keep things going. Featuring works by Moya Henderson, Naima Fine, Andrew Aronowicz, Tansy Davies, Lou Harrison, Claude Vivier, and more! More info on program and performers can be found here! Venue: La Mama Courthouse. 349 Drummond St, Carlton. Bookings and more information: La Mama Theatre, Midsumma Festival. In exciting news, we have a new show this year! Life is a Cabaret, showcasing the glorious music of cabaret, art song, and musicals of the 1920-70s. Performed in the beautiful Melbourne Recital Centre Salon by singers Georgie Darvidis and Kelsey James, joined by Jacob Abela on piano and Miranda Hill on bass. It’s guaranteed to be dazzling. Venue: Melbourne Recital Centre, Cnr Southbank Blvd and Sturt St. Southbank. Date: Monday 22nd January, 6pm. Bookings and more information: Midsumma Festival, Melbourne Recital Centre. Homophonic! is back for it’s 6th fabulous year. 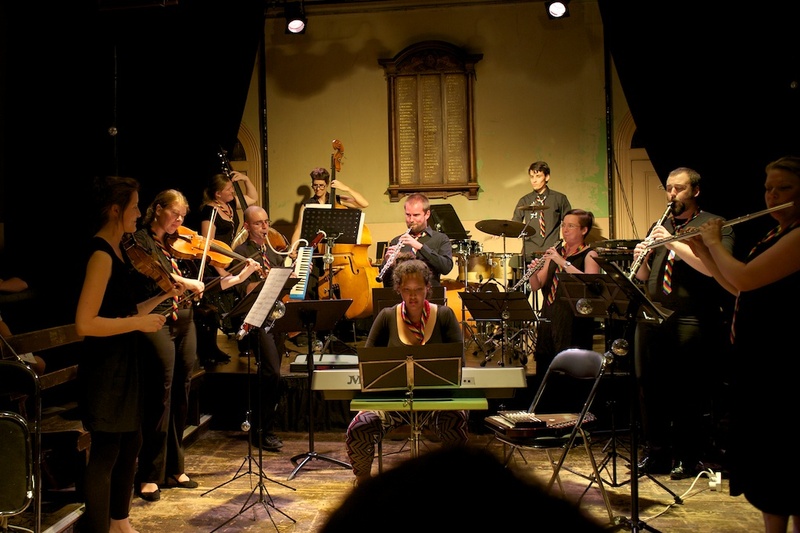 Come join us at La Mama Courthouse for an evening of new classical music by queer composers. Celebrating sapphic symphonists, homosexual harmonies, and the long and proud tradition of composers being as gay as the day is long. Classical music has a rich heritage of LGBT musicians and composers, and this concert is celebrating the legacy of those artists by performing the work of 20th and 21st century queer composers, in an exciting program featuring famously gay composers alongside new Australian music that is sure to entertain and enlighten even the most experienced concert goer. And we’re thrilled to be back at La Mama Courthouse, in the bosom of experimental art making of Melbourne. This year we have a new solo work for Viola by Nirmali Fenn, written for and performed by Phoebe Green; a delectable low trio of two bass flutes and cello by Madelyn Byrne; and an exciting new septet by Marc Yeats, among other treats for your ears. Performers: Ben Opie, Laila Engle, Kim Tan, Belinda Woods, Edward Ferris, Sydney Braunfeld, Allison Wright, Zachary Johnston, Merewyn Bramble, Phoebe Green, Jennifer Mills, Stephanie Arnold, Justine Anderson, Matthew Horsely, Laura Tanata, and Miranda Hill. Directed and presented by Miranda Hill. It’s a Monday and Tuesday night in January! What better time to come enjoy a degustation of new musical creations? It’s sure to become your new favourite midsumma tradition. Oh gosh! It’s that time of year again! Homophonic is back for it’s 5th amazing year. We’re thrilled to be back again at La Mama theatre in Carlton, and have been feverishly researching amazing queer composers for your listening pleasure. 3 Shades Black and the Melbourne Fringe Festival present Immersion. A night of music to bask in, just lie back and let the musicians surround you.Don’t miss this unique experience, with music from minimalism to renaissance chant. Finally! A chance to experience this music as a concert hall won’t allow. Mingle with the music and surround yourself with sound. Bring a pillow, relax in a beanbag, lie at the feet of a tenor, enjoy a drink and be ensconced in our sound world. Rosie Savage, Zachary Johnston, Arwen Johnston, Jarrod Butler, Phoebe Green. Did you know that America’s greatest love story set to music, West Side Story, was written and choreographed by 4 gay men? Did you know Poulenc referred to his “Parisian sexuality” in letters, and openly identified as a gay man? Have you ever listened to the music of Britten or Barber and seen nothing in the program notes about their long term male partners? Then Homophonic is the concert for you! 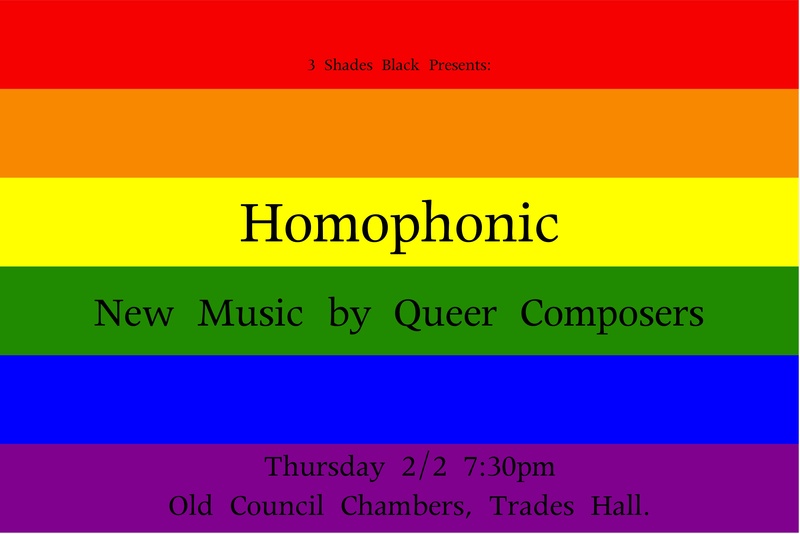 3 Shades Black and the Midsumma Festival is proud to present Homophonic, an evening of new classical music by queer composers. Celebrating sapphic symphonists and homosexual harmonies, and the long and proud tradition of composers being as gay as the day is long. The gays and the arts have always gone together, and this concert celebrates that long standing tradition, and highlights the contribution made to modern classical music. With a program featuring established composers alongside young Melbourne artists, Homophonic is sure to entertain and enlighten even the most experienced concert goer. Performed by an ensemble of Melbourne’s most in demand musicians, and featuring Melbourne composers alongside more established names. We’re bringing the disco ball to the concert hall!! Breathing through a hole, by Amy Bastow. There might have been a time, by Wally Gunn. Ensemble: The Atticus String Quartet, Miranda Hill, Leila Engle, Joshua de Graaf, Dan Richardson, Oscar Garrido de la Rosa, Ruby Paskas, Phoebe Green, Ed Ferris, Stephanie Kabanyana, Bettina Crimmins, and Emma Sullivan. Thursday the 2nd of February, 2012. 7:30pm. 3 Shades Black is excited to announce our next performance as part of the Midsumma Festival in 2012. Homophonic: New music by Queer composers. Featuring local Melbourne composers as well as more established names from the 21st Century with a few surprise visits from the long and proud history of classical musicians being gay as the day is long. Tickets now on sale! One night only, and limited seating.